The 17th century dawned in Ireland during the 9 years war of the northern Chieftains against the Crown. By 1602 that conflict was over; Red Hugh O’Donnell had been poisoned, the Irish had capitulated, and Queen Elizabeth was dead. Against the treachery that threatened their heirs and families, the noblest Chieftains of the north The O’Neill, the O’Donnell, and the Maguire left Ireland forever in what became known as the Flight of the Earls. The Irish were leaderless, the Clan system had been broken, the great Gaelic Houses destroyed, and a foreign power had been established in possession of the land. The conquest of Ireland was finally complete; or so it appeared. Beneath it all, the Bards kept the heritage alive. Outlawed poets started hedge schools; Priests said Mass at stone altars in the hills and glens; the music, the language, and the learning survived – but the British were determined to stop even that limited bit of Celtic culture. After the flight of the earls, James I of England, declared that the recently departed northern Chieftains had been conspiring to rebel, and their estates were forfeit to the Crown. Four million acres of Ulster were given to men called Undertakers – loyal Englishman who agreed to undertake the dispossession of the Irish. Soldiers, drapers, fishmongers, vintners, haberdashers and anyone seeking free land became the new owners of Ulster. A contemporary writer named Stewart, son of a Presbyterian minister, wrote that they were “for the most part the scum of both nations, who from debt or fleeing justice came hither hoping to be without fear of man’s laws.” They hunted the Irish like animals, drove them into the woods, mountains, and moors where thousands perished of starvation within sight of lands that their clans had owned from time immemorial. Before their eyes, an alien nation was planted on the fair face of Irelands proudest province. But the Irish would not starve and die in their own fertile land. Their rage grew daily until an uprising was planned by Rory O’ Moore, Phelim O’ Neill and his brother Turlough, The Maguires of Fermanagh, the Magennis, O’ Reilly and the MacMahons. O’Moore had patiently worked for years among the leading Irish families, Irish Generals in the Continental armies, and other Irish exiles to oust the British. Then, on the night of October 21, 1641, the remnants of the northern clans burst forth sweeping the terrified Undertakers before them. Descendants of the old Clans O’Neill, Magennis, O’Hanlon, O’Hagan, MacMahon, Maguire, O’Quinn, O’Farrell, and O’Reilly burst forth from the hills and, in a few hours, made Ulster their own again. 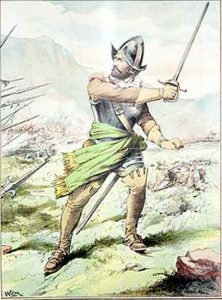 A few days later, Phelim O’Neill was proclaimed head of an Ulster army, and by early 1642, Leinster and Munster joined the fight for freedom; still later, Connaught joined. The Crown, poured men and arms into Ireland to fight the rebels. The Irish gentry formed the Confederation of Kilkenny to direct the resistance, and, believing that the new King, Catholic born Charles I, was a friend of Ireland, they confirmed their stand for ‘faith, country, and King’. The Irish Chieftains yielded for the sake of unity. In England, a struggle between King Charles and his Puritan Parliament developed into a civil war. As his situation grew worse, King Charles began to court the Confederation. Futile negotiations frustrated the fighting spirit of the Irish, and they began to suffer defeat after defeat until, in despair, they considered coming to terms with the English. Suddenly, from the Boyne to the sea, Ulster shook with the news: Owen Roe has come! On July 6, 1642, with 100 officers in his company, Owen Roe O’Neill, landed in Donegal. A mere boy when he had left Ireland with his uncle, Hugh O’Neill, during the Flight of the Earls, he had won distinction as a military commander in the Irish Brigade of the Spanish Army. A trained soldier and military leader, he had returned to lead the fight for Ireland’s freedom. He was given command of the northern army which he rebuilt and began to challenge the English on the field of battle. In short order, he regained all that had been lost due to the procrastination of the Confederation, but jealous of his growing power, they hampered his efforts at every turn. Then, on June 5, 1646, England sent their best field commander, General Monroe, against Owen Roe. This would silence the young upstart forever. Monroe had 6,000 men and a full compliment of field artillery. O’Neill had only 5,000 men and no artillery. The two armies met at the junction of the river Oonah and the Blackwater adjacent to the village of Benburb – a place that would live forever on the lips of the storytellers, for it was here, in one masterful battle, that Owen Roe proved his superiority and that of his army. Monroe’s men were fresh and he set them up so that he would have the advantage of the sun at his back. O’Neill kept Monroe’s nerves and the nerves of his men on edge for several hours in that hot sun while his men harassed them with hit and run skirmishing raids. Finally, when the sun had shifted to behind his back, O’Neill gave the word “Sancta Maria,” and launched a whirlwind attack. His cavalry captured Monroe’s guns, and his infantry overwhelmed the English legions driving them into the river. In one short hour, O’Neill had wiped out the pride of the British army. 32 standards were taken; Lord Ardes and 32 officers were captured; cannon, baggage, and 2-months provisions were taken; and 1,500 horses were now in Irish possession. 3,300 of Monroe’s army lay dead on the field, while Owen Roe lost but 70. Ulster had been won by Owen Roe O’Neill. The Confederation fearing his growing power, would eventually turn on O’Neill, and everything would be lost in the end. But for a brief while, all of Ireland was talking about Owen Roe O’Neill, and the Battle of Benburb on June 5, 1646.